The New York Yacht Club has announced that Lynn Lynch will take over for the retiring Brad Dellenbaugh as Sailing Director. “We feel extremely fortunate that we have found such a talented, experienced and respected individual to step into the rather large shoes that will be left behind by Brad Dellenbaugh,” said NYYC Commodore Philip A. Lotz. A Chicago native, Lynch has worked in the sailing industry in a variety of roles for more than 20 years. 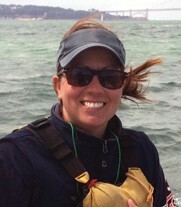 As the Race Director for St. Francis Yacht Club in San Francisco, CA, she oversaw one of the sport’s busiest regatta offices, organizing and assisting with events that covered the spectrum of sailing, including the J/70 World Championship, the Kite Foil Gold Cup, the US Sailing Match Race Championships and the club’s signature annual event, the Rolex Big Boat Series. “My husband and I have always wanted to end up in Newport, RI, and had recently begun to plan our move east,” said Lynch. “I feel very fortunate to be able to take this job, at this club, and build upon the legacy of great regattas and on-the-water member events. For more information, log onto nyyc.org.